Well, not really. Or maybe, actually. But apparently quite a few people think there is power in 32 counties in western PA, OH, MD, and WV. Last year, my older brother, who works for the Greater Raleigh Chamber of Commerce, emailed me a link to a naming contest for that 32 county region. I have no idea what name I suggested, but I do know I did not win (because, as I have blogged about several times, I apparently no longer win anything). A few months ago, perhaps, I started receiving newsletters for the Power of 32 (the eventual name winner). Before too long, I figured out why I was receiving these newsletters, and I actually started reading parts of them, thinking maybe it was something I could get involved in. A number of blogs I read include posts about must-haves, recommendations, and favorite things. Unfortunately, there are very few material things that I absolutely love, and on top of that I have almost no brand loyalty, save for Heinz ketchup because I am a Pittsburgher (I refuse to buy another ketchup for fear I would like that more). I am also a big fan of Kohl's, having shopped there regularly since 1999, but I think the quality has gone slightly downhill. Not so far down that I will stop shopping there, mind you; I hate the mall and love that I can buy most of what I need for myself, my family, and gift-giving in general at Kohl's. But this post is not about those large companies, but rather about two friends who have put their different talents to business. Let me tell you a little about them. There has been some controversy surrounding a comment that Tom Corbett, who is running for PA governor, made recently. He said that some people would rather collect unemployment compensation than return to work. Do I doubt this is true for some people? No. There are dishonest people. There are lazy people. There are freeloaders. There are all kinds of people in all kinds of places. What a great world this would be if everyone always did the right thing, from politicians, to business owners, and to everyone in between. But not everyone does, unfortunately. In fact, most of us have, at one time or another, done a few things that we could justify or that were not "so bad." And on the computer. And from what people tell you. I read people's blogs and their Facebook pages. I talk to people about their lives. But then something happens, and I think that either I did not really know these people or they are living two different lives, the one everyone sees and the life they actually live. More often than not, this phenomenon I am speaking of is related to marriage. A friend will talk about how happy she is, how great her husband is, etc. Then, bam! The marriage ends. Sometimes it is not that dramatic. It may be that I have never heard a friend complain about her spouse. Everything seems fine for them while I am feeling kind of bad because I am venting about something my husband did. Then some time goes by and this friend tells me she and her husband are getting a divorce. And for some reason I feel as if I am in this dissolving marriage. That I am the one who has been hurt. And I don't know why. Other than I guess I just feel kind of blindsided. 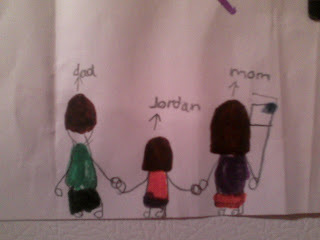 When I first had Jordan, I got a lot of grief from childless people who wanted me to do what I thought were unreasonable things. From taking my baby out to a smoky bar/restaurant to meet people when she should have been down for the night. To waking up my napping toddler to drive somebody somewhere. To entertaining houseguests in my small, guestroom-less house. More often than not, I would give in, because guilt really gets to me. Other times, I would say no, but then feel bad, thinking I was abandoning people that I might not get to see for quite a few months. But in most cases, no matter what I did (or did not do), I ended up feeling resentful. Of course, when those same people had children, things were different. This past weekend I went to State College (Penn State) for Arts Fest, which is technically called the Central Pennsylvania Festival of the Arts. The first few years after I graduated, I was a fairly frequent visitor of Dear Old State, but as the years went by, eventually just about everyone I knew graduated or moved. 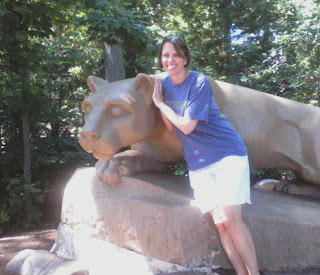 And then I had a kid; my last time at Penn State was for a football game in 2002, probably a month before I got pregnant. In some respects, it seemed a lot like it was when I left. Most of the same buildings were there. Students waited in long lines to get into bars. I would walk past a place, and a memory would come rushing back. But, of course, there were many changes. New buildings. Shinier things. Recycling was everywhere. The Loop bus was nowhere to be found (I think there is a different version of it, and it is not blue). 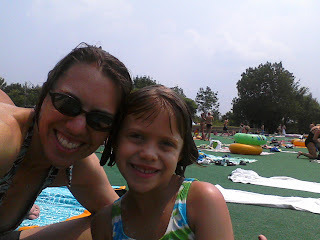 Today I took Jordan to the wave pool at Boyce Park. Despite living in the eastern suburbs for over 11 years, I had never been there before. Since I have been a grown-up, I have not been much into public swimming; just not a fan of seeing myself in a bathing suit, plus I am a wimp when it comes to cold water. But because I took J there for swim lessons this morning and it was so hot you could fry an egg on the sidewalk, I figured we might as well stay to swim. And by stay, I really mean leave to find an ATM (since I had only six bucks in my wallet) and then come back. Wishing you all a happy and safe 4th weekend. I will be sure to sing the Star-Spangled Banner a few times. As much as some people are not fans of that song (mostly due to the broad vocal range), the words are pretty great. I still tear up almost every time I hear it played, which is mostly at sporting events. Though nobody ever sang it as well as Miss Whitney, IMO, back in the day. We have had our new windows for a couple of months, and I am happy to report that we are very satisfied. I really think it has cut down on the outside noise and has kept the house cooler (and warmer, for those few cold days we had in May and/or June). I hope we are still happy years down the road. But I also hope that we are no longer in this house in another seven years! For those of you whom I am not friends with on Facebook, I wanted to post pictures from a dog wedding Jordan and I attended over the weekend. Four-Footed Friends, a no-kill animal shelter in Indiana County, where my mom lives, hosted this fundraiser, and as someone who regularly supports Animal Friends, a no-kill shelter around here, I was only too happy to attend, despite the near-90 degree temps. The picture below is of Lenny, the groom, walking down the aisle. It did take him awhile to get there, thanks to his wanting to sniff a garbage can. Soon after, the best dog and maid of honor took their turn. Eventually, Cleo, the blushing and furry bride began her walk. Notice the garter on her back leg!